spect to the ex situ and in situ references is more closely related to the morphology change of particles (nanoplatelets). 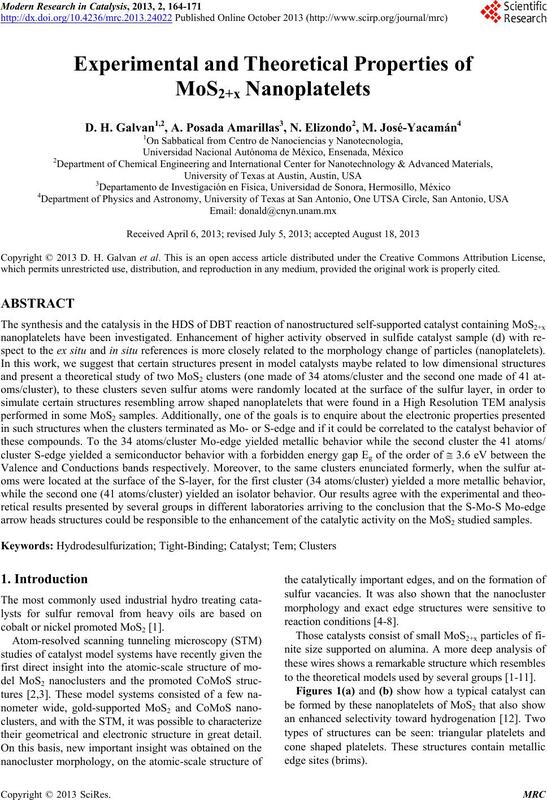 arrow heads structures could be responsible to the enhancement of the catalytic activity on the MoS2 studied samples. cobalt or nickel promoted MoS2 . their geometrical and electronic structure in great detail. to the theoretical models used by several groups [1-11]. by High Resolution Electron Microscopy (HREM). neutralized with a saturated solution of NaOH. 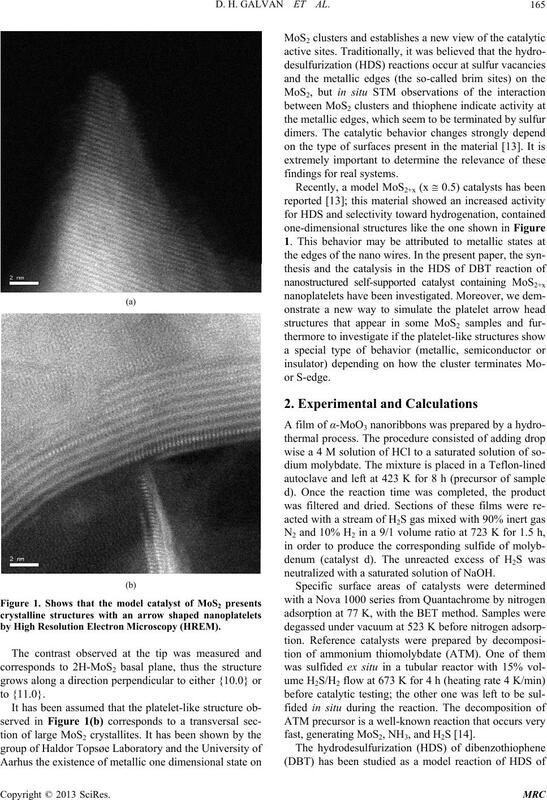 fast, generating MoS2, NH3, and H2S . D. H. GALVAN ET AL. out in a Parr Model 4522 high-pressure batch reactor. tan CCD camera was used for image acquisition. the intrinsic contributions included in the parameter set. space group P63/mmc (194) . t the calculations were obtained from Alvarez et al. one of the parent oxide. phase are 82% and 18% in weight respectively. nanoplatelets and the MoO2 were obtained. references has can be seen from Table 2.
ex situ references (see Table 2). ionization potential and exponent of Slater type orbitals). Helmholtz formula was used to calculate Hij . 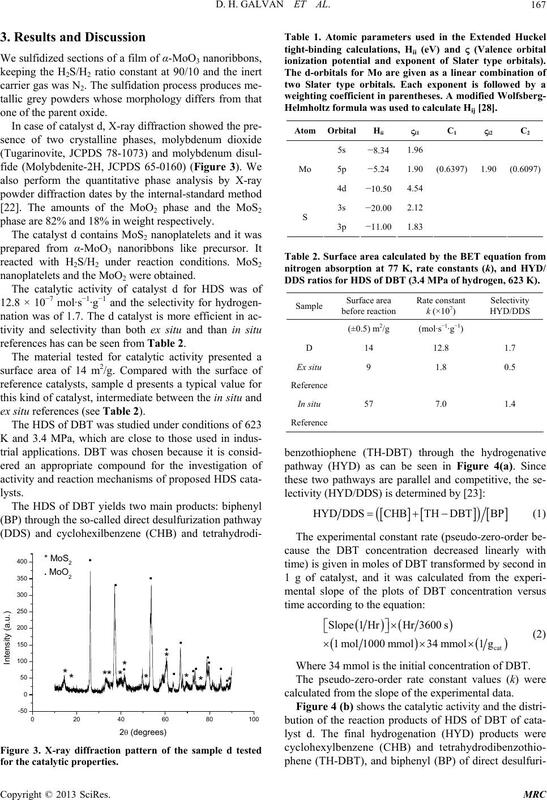 DDS ratios for HDS of DBT (3.4 MPa of hydrogen, 623 K). Where 34 mmol is the initial concentration of DBT. lculated from the slope of the experimental data. ity HYD/DDS plots of sample d.
has can be seen from Figure 4(c). ures 5 and 6(a) and (b), respectively. M (1/2 0 0) of /a. at the surface of S-layer. 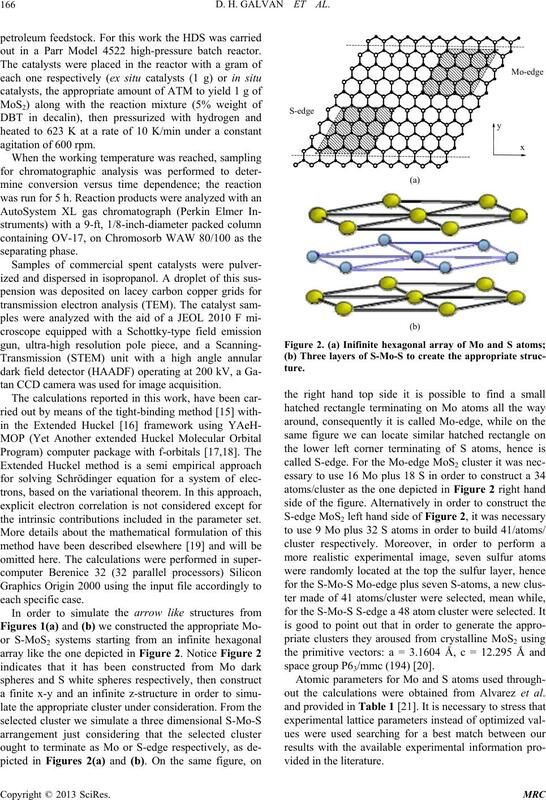 Mo-edge with seven S-atoms at the surface of the S layer. 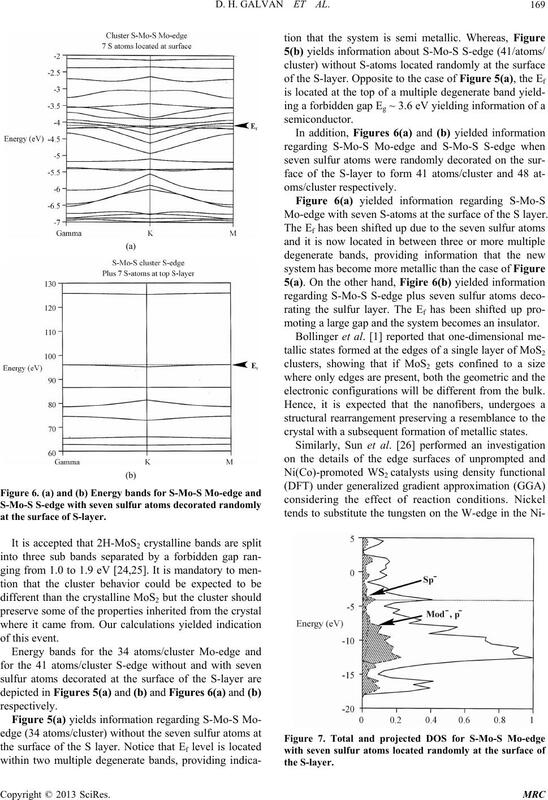 moting a large gap and the system becomes an insulator. electronic configurations will be different from the bulk. crystal with a subsequent formation of metallic states. of tungsten at the S-edge in the Co-promoted catalyst. e to acknowledge E. Aparicio, M.
 M. V. Bollinger, J. V. Lauritsen, K. W. Jacobsen, J. K.
lence band and the conduction band. layer, the system indicates an insulator behavior. ters, Vol. 87, No. 19, 2001, Article ID: 196803. S. Helveg, J. V. Lauritsen, E. Lægsgaard, I. Stensgaard, J.
 J. V. Lauritsen, S. Helveg, E. Lægsgaard, I. Stensgaard, B.
 J. V. Lauritsen, M. V. Bollinger, E. Laegsgaard, K. W.
Jacobsen, J. K. Nørskov, B. S. Clausen, H. Topsøe and F.
Vol. 221, No. 2, 2004, pp. 510-522. Catalysis, Vol. 187, No. 1, 1999, pp. 109-122. 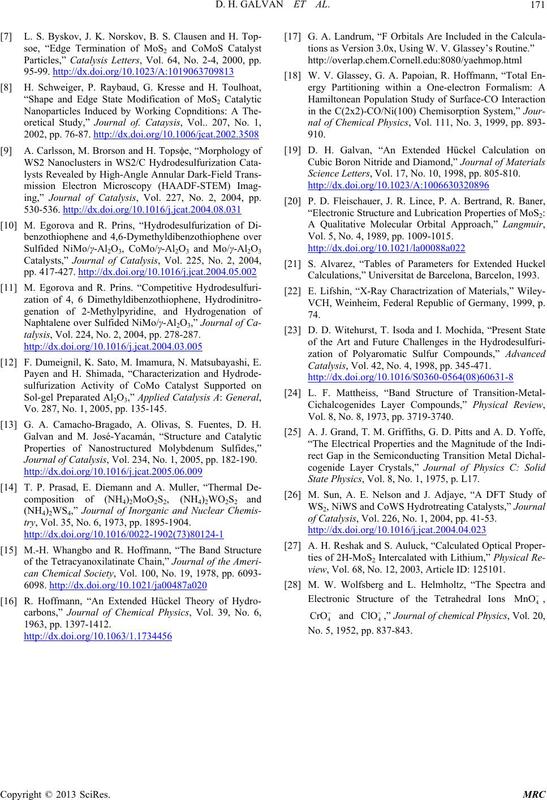 Science Letters, Vol. 17, No. 10, 1998, pp. 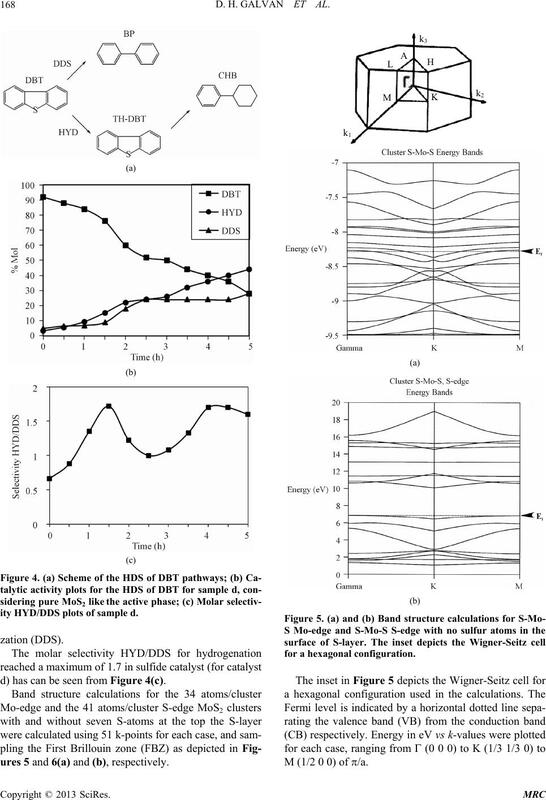 805-810.
ing,” Journal of Catalysis, Vol. 227, No. 2, 2004, pp. Vol. 5, No. 4, 1989, pp. 1009-1015. Calculations,” Universitat de Barcelona, Barcelon, 1993. VCH, Weinheim, Federal Republic of Germany, 1999, p.
talysis, Vol. 224, No. 2, 2004, pp. 278-287. 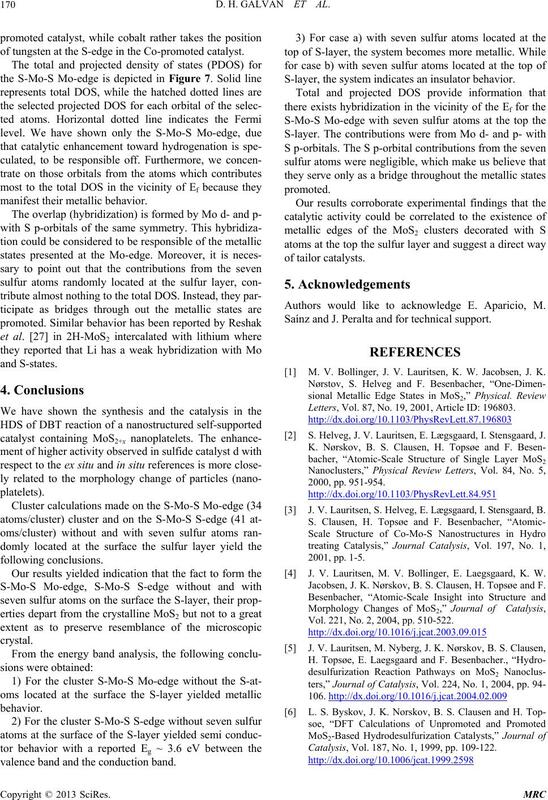 F. Dumeignil, K. Sato, M. Imamura, N. Matsubayashi, E.
Catalysis, Vol. 42, No. 4, 1998, pp. 345-471. Vol. 8, No. 8, 1973, pp. 3719-3740. Vo. 287, No. 1, 2005, pp. 135-145. G. A. Camacho-Bragado, A. Olivas, S. Fuentes, D. H.
State Physics, Vol. 8, No. 1, 1975, p. L17. try, Vol. 35, No. 6, 1973, pp. 1895-1904.
of Catalysis, Vol. 226, No. 1, 2004, pp. 41-53.
view, Vol. 68, No. 12, 2003, Article ID: 125101. No. 5, 1952, pp. 837-843.